The iPECS-MG is a highly reliable, extensible and feature-rich business platform that integrates your PSTN, IP and mobile networks providing SMBs with improved business productivity. As a hybrid system, the iPECS-MG supports complete single network IP solutions as well as mixed deployments consisting of both IP and TDM extensions.. The iPECS-MG offers an approach to IP that ensures increased application performance and enhancements in the areas of converged voice, data and multimedia along with security, mobility, management and serviceability. The iPECS-MG interworks seamlessly with LG-Ericsson UC solutions to extend full headquarters-based applications and capabilities to branch and remote offices. As a standalone solution, the iPECS-MG can be combined with a full range of LG-Ericsson voice and data products to create a complete converged business communications system that meets the unique requirements, challenges and budgets of SMBs. The iPECS-MG provides extensive telephony features and value-added applications and also supports a full range of LG-Ericsson phones - fixed or mobile sets, both IP and digital based, conference phones and soft clients. On the data side, LG-Ericsson’s data portfolio drives the solution’s networking capabilities with certified tested and proven Ethernet switches – providing high-speed data transfer, secure Internet access, VoIP Quality of Service (QoS) and Power over Ethernet (PoE). 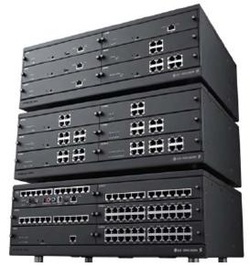 Tying these elements together are the Network Management Solution. This software tool allows centralized configuration and monitoring of all these devices, both on premises or remotely. A smooth migration from TDM based environment to Pure-IP is eased with the iPECS-MG enabling SMBs to protect their investments and the iPECS-MG let them seamlessly migrate to an IP convergence world when it works best for their business.